Nostalgic, fun and whimsy fill our color scheme inspiration. 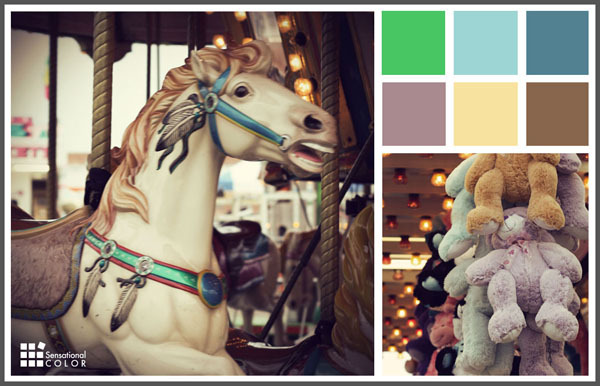 Hues selected from the photos of an old fashioned carnival will bring energy and vintage appeal to any space. Soft blues and lavenders and yellow tinted neutrals allow for a calm environment while more vibrant pops of green, turquoise, and yellow add energy. The neutral walls and furniture in this room bring a fresh look to the space while the pops of color add interest. This vibrant color scheme is playful and sophisticated while feeling comfortable and relaxed. Creating an entryway full of life is a great way to welcome everyone. Walking through that door is like a breath of fresh air with a palette of muted blues and oranges and a perfect amount of white to keep the space fresh. A bedroom with a pop of whimsy and vintage tones lends a nice touch to a calming space without being boring. Pale blues, soft pinks and bold yellow creates a canvas of happy while the darker green and peach help to level the mood. Waking up has never been more refreshing. LOVELY PICS:) I really like your blog…so much nice inspiration. Thanks for sharing those inspirational pictures. It is my goal to have a house similar to the one featured above, I am getting there slowly but surely. I do think it is about clean white lines with pops of intentionally placed colour :).